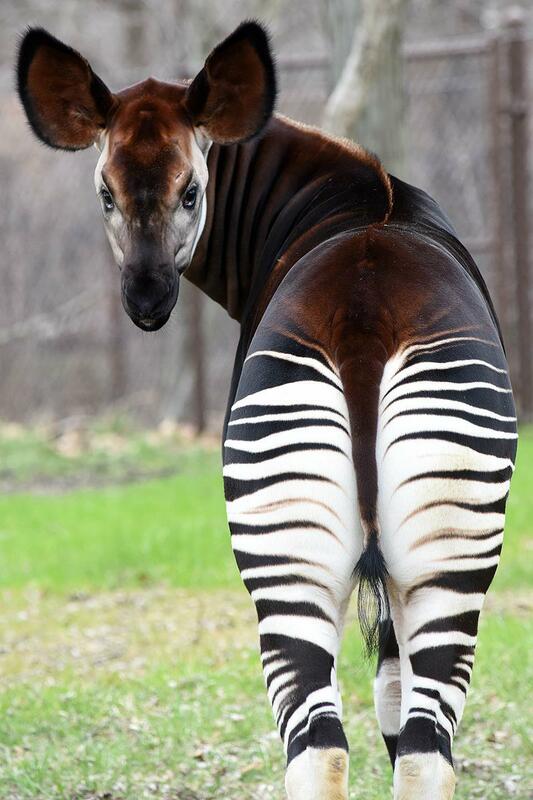 Do you know what an okapi is? It’s all right if you don’t. As it turns out, Brookfield Zoo in suburban Chicago is known for revealing some of the planet’s most unusual animals. 2956: White-cheeked gibbons in Brookfield Zoo’s Tropic World: Asia habitat. Photo: Chicago Zoological Society. Covering the entire Brookfield Zoo is quite an accomplishment. Having been there only once since I was a child, I had no idea how large this enormous attraction had become when I visited again the Sunday before Labor Day. This lifelike home for animals, situated less than an hour away from Chicago, cares for about 450 creatures across nearly 220 acres. But while it definitely takes a whole day to complete the trip, you won’t want to miss any of Brookfield’s divine species. In fact, hours will fly by because you’ll be busy marveling at animals you’ve probably never heard of or seen before. Adding to the excitement, the zoo periodically introduces “pop-up” installations of rare animals for a limited time. Upon entering through Brookfield Zoo’s south entrance, you are immediately greeted by the Hamill Family Wild Encounters. Here, little ones can get up-close-and-personal with creatures such as alpacas, llamas and goats. Popular favorites include big-antlered reindeer, adorable red pandas and canary yellow parakeets. Part of this three-acre facility is reserved for observation, while the other area allows for children up to age 10 to participate in building animal shelters, petting their favorite animals and even tracking certain species’ prints across time. As you continue your walk through Brookfield, you’ll come upon popular felines in the Big Cats section. Since they sleep for most of the day, it’s likely that African lions will be stationed on top of their habitats, overlooking the crowd. Two Amur leopard cubs have their own grasslands to prance about, while the Amur tiger can be found playfully leaping from boulder to boulder in his own home. 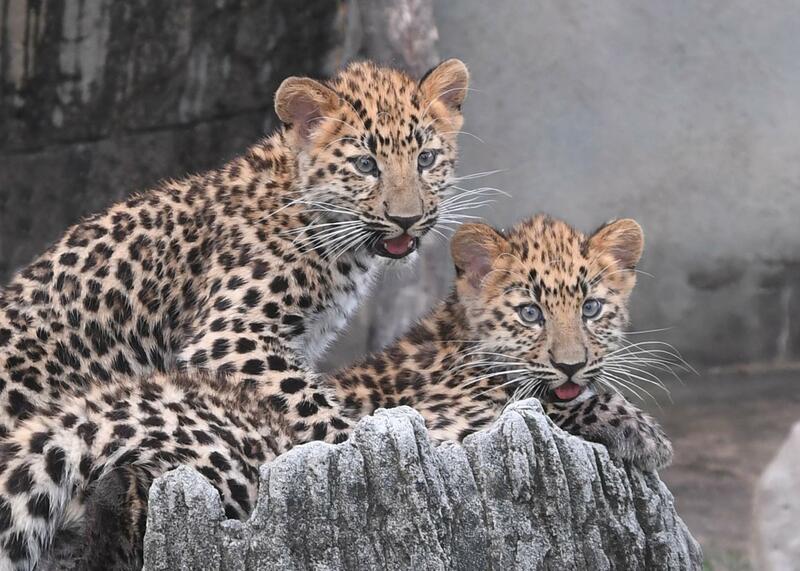 2120: Amur leopard cubs born in April 2018 can be seen in their outdoor habitat at Brookfield Zoo. Photo: Chicago Zoological Society. The walk through the Big Cats exhibition will bring you to the Clouded Leopard Rain Forest. The clouded leopard usually observes the crowds from up above. Other mammals include a tiny fishing cat, lines of spotted frogs, multi-colored Prevosts squirrel and gray binturong, a bearcat native to Southeast Asia. Inside, visitors will also witness a variety of lizards and leggy creatures crawling around their tanks. Animals such as the African giant millipede and the Chinese Emperor newt lie inside cages filled with rocks and greenery. Though tiny, these creatures each possess dangerous traits. The newt’s orange warts, for instance, withhold poison that can kill an estimated 7,500 mice! Combine your land adventures with a tour down south, specifically where the seals and dolphins frolic all day long. Start out with a stroll through Pinniped Point, a pool area that houses large seals and sea lions. On particularly hot days, you’ll see them cooling off in the pools and putting on an underwater show for visitors in the viewing tanks downstairs. 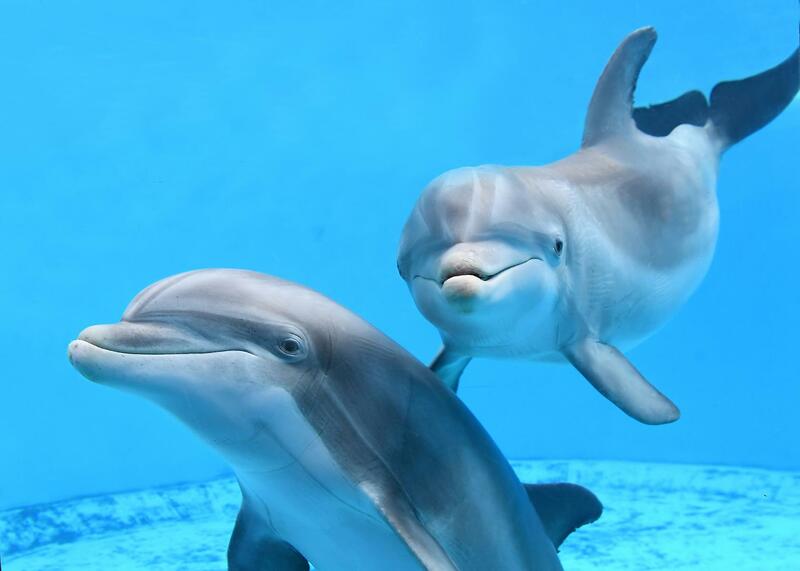 Amiable bottlenose dolphins linger in the Seven Seas tanks nearby, equally ready to show off their aquatic skills. 8813: Dolphins can be seen daily at Brookfield Zoo’s Dolphins in Action. Photo: Chicago Zoological Society. One of my personal favorite exhibits was stationed at the other end of the zoo, otherwise known as Tropic World. It is actually a trio of enchanting rainforests and wetlands reminiscent of South America, Asia and Africa. Visitors are greeted by a light waterfall in the South American rainforest, followed by dozens of colorful apes swinging from tree to tree. Two-toed sloths, commonly known as the world’s slowest mammals, rest in the branches above, while a giant anteater looms in the swamps below. The Asian forests present bright orange orangutans and gibbons, while the African forest slopes into a forest of black-and-white colobus monkeys and hungry (for fruits, plants and vegetables, that is) gorillas. 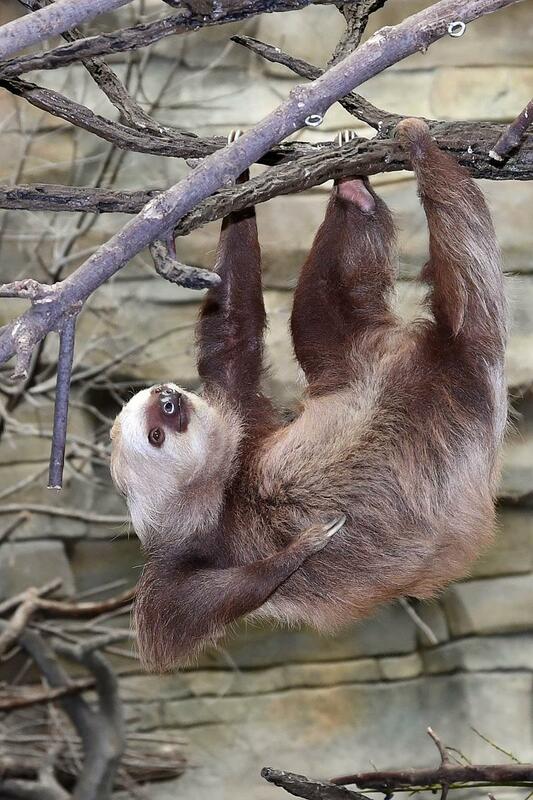 4706: A two-toed sloth moves across a vine in Brookfield Zoo’s Tropic World: South America habitat. Photo: Chicago Zoological Society. Tropic World’s rainforests are located near Great Bear Wilderness, the perfect place to see grizzly bears and polar bears, plus American bison, a pack of Mexican gray wolves and a bald eagle. One of the most amusing parts of this exhibit is watching the grizzly bear relaxing in a giant pool to balance his body temperature in hot conditions. Other animals available for viewing are a bald eagle and numerous Mexican gray wolves. 6084: A polar bear at Brookfield Zoo’s Great Bear Wilderness. Photo: Chicago Zoological Society. From here, step over to the Habitat Africa! savannah and forest. The savannah houses photogenic giraffes that roam about grasslands and feast on plants. You will also find a red river hog, African painted dogs and a klipspringer, a smaller version of an antelope with horns and heightened sense of smell. In the forest section, you will be taken with the majestic okapi. The okapi, related to the giraffe family, boasts smooth brown fur, striped legs and large ears. This Democratic Republic of Congo and central Africa native prefers dense forestry as its home base. Creatures belonging to the Hoofed Animals section neighbor the African wildlife. Watch a brown humpback-camel take in more water than you can imagine, and the Mongolian Przewalski’s horses trotting around in the open plains. 2016: An okapi, also known as a forest giraffe, can be seen in Brookfield Zoo’s Habitat Africa! The Forest. Photo: Chicago Zoological Society. I finished my tour of the permanent exhibits at the Pachyderm House, where I encountered the world’s most dangerous land mammal – a hippo! Thankfully, Brookfield’s hippo is well secured in a shallow pool surrounded by rocky walls. Rhinos also live in this exhibit. Catch them searching their area for shrubs and communicating with fellow rhinos through their ears and tails. 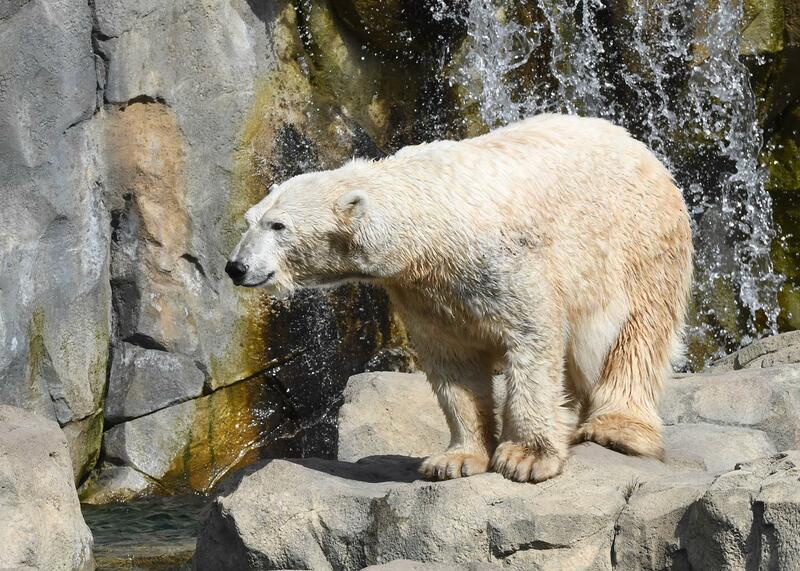 In addition to noteworthy animals, Brookfield Zoo offers numerous opportunities for students to participate in activities. Everyone will line up to ride their favorite animals on the musical carousel. Classes are invited to ride the tram throughout their visit. The tram picks up passengers at any one of four stops and carries them through out the zoo. Along this ride, make sure to stop by Brookfield’s 3D Theater for a 20-minute, interactive film of animals and dinosaurs in their natural surroundings. Teachers will also want to register the class for the zoo’s dolphin shows, a fun way to entertain the whole class as they learn more about the water mammals’ grace and athleticism. As you prep for your trip, don’t worry about lunch. Brookfield provides several cafes that sell everything from burgers, to pretzels, to smoothies, to Dippin’ Dots ice cream. Restroom stops are located near each dining location, and gift shops accompany many of the exhibitions. For more information about student tours, visit www.czs.org/Brookfield-ZOO/Plan-Your-Visit or call (708) 688-8431.